"Wow! Come and see this! You're gonna love it - it's the coolest thing I've ever seen!!" "Okay, hold on. Right - what am I looking at?" (After an unimpressed pause) "Is that it?" I'm sure we've all been there. We find or discover something that really excites us and, in our enthusiasm to share our joy with others we enthuse with them about it and urge them to join us in our joy. Only to discover that they are singularly unimpressed. Cue others heading, sometimes indeed flocking, to the north coast of Northern Ireland in the hopes of sharing in our joy. But very often, the actual experience can lead to disappointment (I didn't see it) or indeed outright scepticism about any photos taking of the display ("Nice photo(shop)" was a comment I recently saw below an aurora shot on Facebook). "Does it actually looks like this in real life?" The simple answer is no. It doesn't. And that doesn't mean that the photos you see are the result of some Photoshop trickery. It's just simply the difference in the way our eyes and our cameras see the night sky. In this blog post, I want to show you what these displays actually look like. Only partly to address The Photoshop Issue. But mostly because I want those of you who have your hopes set of catching the display at some stage for yourself to have clear ideas of what to expect, so that, when you do see an aurora, you'll actually know that you have! To do that, I have 'downgraded' a few of my aurora images to try to reflect more closely what I actually saw with my eyes when I was taking the shot. This first shot is from the Great Christmas Eve Aurora of 2014. This was most definitely visible to the naked eye - but as off-white, as you can see if you click or tap on the image below. The white first appeared visible in breaks in the cloud as the display intensified around 1.00 am. Then, when the clouds cleared more fully, the whole horizon all of a sudden glowed a more intense white and the vertical light pillars also became visible. I liken it to WW 2 search lights shining up into the night sky. The light pillars are of about the same intensity and always remind me of search lights when I see them. One thing to note is that aurora displays ebb and flow. Sometimes the intensity drops back and the white almost disappear from view. Sometimes, as is the case in the photo below, they grow again in intensity and become a lot more visible. That means it's well worth hanging around for a few hours when a display is happening - you never know when it'll all kick off again. And while I'm on the subject, get somewhere as far away from light pollution as possible. And, please, keep torch use to an absolute minimum. By all means, be safe when you're clambering around the sea's edge in the dark, but it takes about 20 minutes for your eyes to become fully dark adjusted. That means every time you turn on a torch (or even look at your phone), you've degraded your night vision for the next 20 minutes. And, if you use a torch, you may well end up degrading the night vision of all those around you too who've be careful up to that point to protect their night vision! Click on the left and right arrows to see the final shot compared to what was actually visible. It's hardly surprising that the most intense aurora display of the past 30 years produced light that was more visible and indeed some colour visible to the naked eye (the science bit is towards the end of this blog if you want to find out why this is). This much hyped display drew the crowds to the north coast on a Friday night. But most went home disappointed, thinking there was no display. In fact there was. But it was a faint one that only was visible on camera. The faint display combined with a very hazy sky plus a full moon that rose at around 21.30 to ruin any chance of seeing it with the naked eye. In fact, my best shot of the evening was before the moon rose at around 21.05 when it was dark enough to pick out some faint vertical structures. At this stage, most of the crowds hadn't yet arrived. 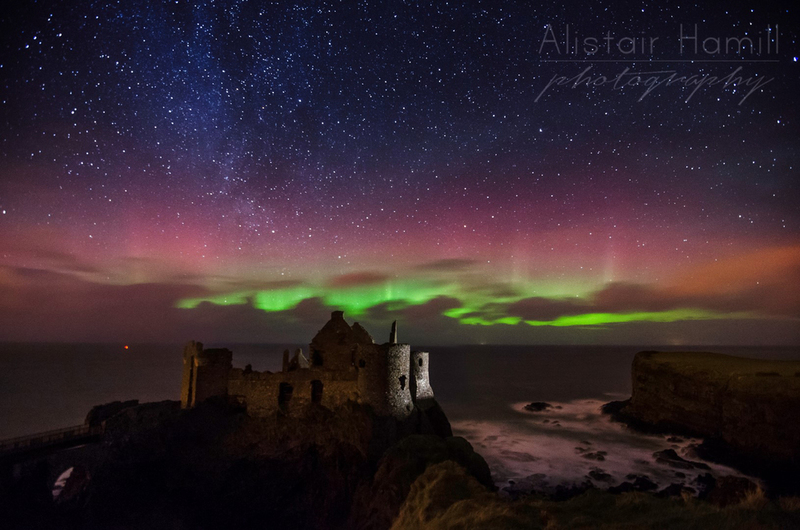 Aurora shows aren't all in the wee small hours! So there you are. That's what it really looks like. And I sincerely hope you're not left saying, 'Is that it?' What you actually see may not look like what a camera will show. But I can honestly say, colourful or colourless, that the thrill of seeing a big aurora display in real life is still one of the most breath-taking experiences I have had on the north coast, and one that I am more than willing to sacrifice significant amounts of sleep for. And certainly something worthy of an exclamation mark or two!! For those of you a bit more interested to discover why the camera sees things that eyes don't, here's a bit of an explanation. It relates partly on how our eyes see in the dark, and partly on how a camera collects light. rods - these operate at night; they are more sensitive to low light conditions, but they do not perceive colour. This is the essence of why we don't see colour in aurora - at night, in the dark, there is simply not enough light coming from the display to activate our cones. Only the most intense displays produce enough light to even being to activate the cones so we can perceive the colour. And then, it tends only to be the greens we see as our eyes are simply a lot less sensitive to the red end of the spectrum of light. A phone shot of what appeared on my camera screen during the February 2014 display. This was only a 2 second exposure on my camera! This exceptional display was more than bright enough to see, even from inside the car with all the dashboard light as we drove north. But even in this case, the colours were not visible to the naked eye. the light sensor in the camera doesn't have cones or rods - obviously - and will register colour in any light that it picks up. The brighter the light, the stronger the colour. Long exposures - we will typically have the shutter on the camera open for 15 to 30 seconds. That means you have all this period of time for light to register on the sensor in the camera. Wide open apertures - the aperture refers to how big the space is in the camera to let the light through. When photographing the aurora, we open the apertures as wide open as we can. So we have long exposures, through a wide open aperture, pouring light onto a sensor that can still perceive colour for at least 15 seconds. It's no wonder that the camera shows more than the human eye. Are photographers 'cheating' when we post shots with colour? No, we are simply using good camera techniques to produce the best shots our cameras are capable of producing. And you too can achieve shots like this with the right kind of camera. Here's a blog I did giving some tips on how to photograph the aurora. If you have a camera, why not read up on how to get shots like this and have a go next time there's a display? But even if you don't, get on out there anyway. It truly is amazing to see a bright display for yourself. And when I see the next display, I'll be sure to let you know in Facebook. And I'll try not to use too many exclamation marks, just in case I raise your expectations just a wee bit too high.